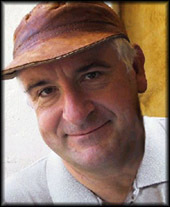 Having spent a good many years working with my friend and late primate, Douglas Adams, I maintain a small and irregular archive of stuff related – occasionally tenuously – to Douglas’ life and work. This is it, and any relationship to objective reality is purely coincidental and probably unintentional. For your interest and amusement, click on the “Continue Reading” button to play my original Java port of the Infocom Hitchhiker’s Guide to the Galaxy game. The game is Copyright © the estate of Douglas Adams . ZPLet Java Z interpreter courtesy of Matthew Russotto. Software archaeology by myself, Richard Harris at <a href="” title=”Home page”>Two Worlds Research. To help you with the basics of playing the game, here’s a few basic commands to get you started. Commands are entered at the > prompt at the bottom of the screen. These are only a small part of what the game understands – try whatever English commands seem appropriate at any given point. Note that the game only recognises the first six characters of each word. Your article in Sunday’s ST on Douglas Adams was as striking an example of sloppy, ill–informed and assumptive journalism as I have come across, painting as it does an entirely erroneous picture through a combination of inaccurate, partial and unattributed information and unfounded speculation. Your avoidance of verifiable source through the use of terms such as ‘a close friend’ and ‘sources close to’ is indicative of very poor or undiscriminating journalism – any genuine friend of his would be more than happy to go on record with anything they had to say about him. Blighted? – I can think of few people to whom the term is less applicable – you make a cheerful and gentle man sound like some tortured latter–day Vanderdecken, forever attempting to round the Cape of his writers block. Douglas’s inspiration rarely deserted him – part of his problem was not merely being interested in too many things, but actually being capable of driving people’s perception of what the future could be. In recent years, he’s been at least as much respected for his ability to articulate a shared vision of the future of society, technology and the environment as for his original fiction. It’s in this area and the inspiration he’s provided through his work with scientists, engineers and philosophers that may in fact prove to be his most important legacy – many of the world’s greatest thinkers and innovators will cheerfully acknowledge the inspiration and challenge that a discussion with Douglas could provide.